Today's readings fit the Year of Mercy well. In the first reading, we read of the prophet Elijah encountering a mistress whose son fell sick. 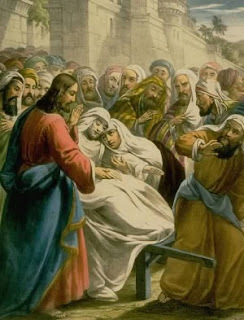 The son stopped breathing and the woman complains to Elijah, "Why have you done this to me, O Man of God? Have you come to me to call attention to my guilt and to kill my son?" The woman thought Elijah was there to punish her and her son. However, Elijah does not condemn her. He simply says, "Give me your son." From there, Elijah calls out to God for mercy." The child then came back to life. After witnessing this, the woman confirmed that Elijah was indeed a man of God. Here we see God's mercy (Mark 2:13-17). While the mistress was 'living in sin,' God was still there for her and gave back life to her son. We must be merciful to others and not judge them. Instead, we should pray God for rescuing us as the Psalm today tells us. God is always with us and never lets our enemies win (Psalm 25:2). When we hit rock bottom, so to speak, God is the one who brings us up. He may get angry, but it is for a moment. This is of course antropomorphic language. We must trust in God as our helper for He will turn our mourning into dancing, our sorrows into joy and our sickness into health (Jeremiah 31). In the second reading, we are reminded that the Gospel is not of human origin (John 1:1). Christianity is not man-made. It is not some idea that a person invented. The Gospel comes from God. This Gospel transforms lives as St. Paul testifies by reminding his audience that he persecuted the Church at one point until the Son was revealed to Him. We must try our best to live out the Gospel in our lives. It is this living that brings us and others to Christ. When people see us witnessing to the Gospel, they will become curious about it. They will wonder what makes Christians so joyful and so coutner cultural. This will lead to conversions as these inquisitive people begin to learn and understand the faith. The Gospel brings our souls back to life after it is killed off by sin, both venial and mortal. Finally in the Gospel, we read about the miracle of Jesus raising a young man who has passed away. This young man was the only son of a widow. Jesus saw the woman and felt pity for her and told her "Do not weep." Then He tells the bearers of the coffin to stop and says, "Young man, I tell you, arise!" The dead man then sat up and spoke. The people glorified God and said that a great prophet was among them. This is connected to the first reading. Both stories are similar, but one major detail is obviously present. While Elijah was seen as a man of God by the woman he encountered, Jesus is much more; He is God. Jesus is the lord of life, death and mercy (Romans 14:9). He sees our suffering just like He saw the widow suffering over the death of her only son. In this Year of Mercy, let us be more merciful and not judge others. This is why Pope Francis has frowned upon using the term 'living in sin' to classify certain people. In reality, we are all 'living in sin.' We have no right to magnify the sins of others as if they are sinning on a higher level than us. We all sin. All men, women and children have fallen short of God's grace (Romans 3:23). We must be merciful because where sin abounds, grace abounds even more (Romans 5:20). Jesus not only restores physical life, but spiritual life. We must seek Him and ask Him to raise us up again when our souls get lost in the death of sin. May Jesus Christ be praised!